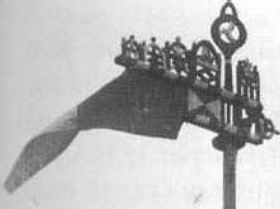 During the latter half of U-47's wartime career, an elaborate pennant was often attached to the commander's flagstaff when in port. This first appears in the photographs of U-47 when the U-boat returned from the successful sixth patrol. The Pillkoppen pennant was associated with the East Prussian fishing village of Pillkoppen - today Morskoje (Морское) in the Russian Kaliningradskaya Oblast - which lies on the Kurische Nehrung, or Curonian Spit. Stretching some 100km along the coast of the Baltic Sea from the Sambian Peninsula in Russia to the Lithuanian port city of Klaipeda (formerly Memel), this fragile and ecologically important sliver of land is now protected by the United Nations as a World Heritage Site. The Kurische Nehrung encloses the Curonian Lagoon or Kurische Haff, which lies to the west of what is modern-day Lithuania. According to a popular old Baltic legend, the Kurische Nehrung had been created by the giantess Neringa, while she had been playing on the shore as a child. 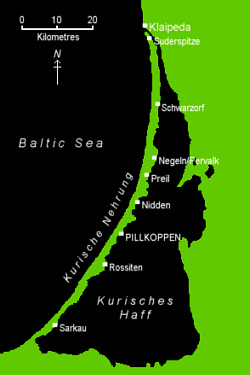 A map of the Kurische Nehrung, or Curonian Spit, with all of the main fishing villages. These villages had a rich history, and were once part of the German territory known as the Memelland. The former village of Pillkoppen is now called Morskoje, and in is Russia just south of the border with Lithuania. The Kurische Nehrung, and with it the village of Pillkoppen (known also in Lithuanian as Pilkopiai) had once been be part of the German-speaking region known as the Memelland; following the end of the First World War and German borders being redrawn in 1919, the northern part of the Kurische Nehrung became Lithuanian while the southern part was absorbed into what was soom to become the Soviet Union. The loss of this part of Germany to the harsh terms of the Versailles Treaty was one of the demands which many Germans believed to be unjust. Given that Günther Prien was a fiercely patriotic German, the use of the Pillkoppen pennant upon U-47 is likely to have been a reference to the separation of the Kurische Nehrung from Germany by the despised Versailles Treaty. The fishing vessels used by the inhabitants of the small villages situated on the Kurische Nehrung were traditional wooden flat-bottomed boats which were around twelve metres in length; they were used to catch fish by dragging a large net, or Kurrennetz, in pairs. The name given to this type of boat was the Kurenkahn, named after the Curonian (Kursenieki) people who used them. These vessels all carried decorative pennants, Kurenkahnwimpeln or Kurenwimpeln; prior to 1844 these flags had been merely decorative, but during this year an order was given to use these flags to identify which village a fishing boat belonged to. The Kurenkahnwimpel used by fishermen from the village of Pillkoppen was an elaborate and ornate wood carving featuring a three-masted sailing ship, an elk and the legend Gott mit uns ("God is with us"). Other items that appeared on the carving included a building, a single-masted yacht and a year - probably that of the building of the vessel. 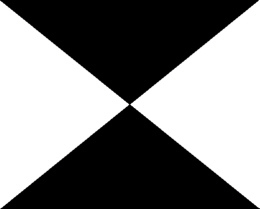 Incorporated into the design was a small recognition flag (Kurenwimpelzeichen) that signified the village the boat belonged to; the recognition flag for Pillkoppen consisted of two white triangles with their points facing towards each other on a black rectangular background. Tailing off the design was a red and white pennant, which was around a metre in length. 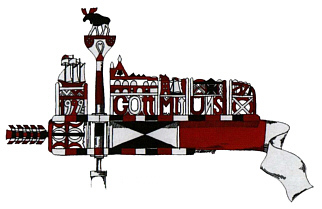 Left: The elaborate pennant, or Kurenkahnwimpel, of the Curonian village of Pillkoppen. Right: Each of the Nehrung villages incorporated a small flag, or Kurenwimpelzeichen, which was used for recognition purposes. This was the the design used vessels from the village of Pillkoppen. 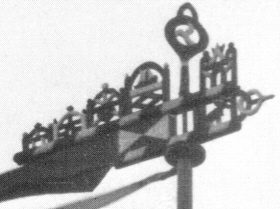 The Kurenkahnwimpel that was displayed on U-47's mast was something of a simplified version of the wood carving used by the fishing boats from the village of Pillkoppen; it featured two diamonds, a heart, a representation of a ship, a stylised elk, and what looked like two men arm-wrestling at a table. Key to identifying U-47's Kurenkahnwimpel as being from the village of Pillkippen was, of course, the recognition flag - the Kurenwimpelzeichen. Two photographs of U-47's Pillkoppen pennant. Note the elaborate design and recognition flag, or Kurenwimpelzeichen; the stylised elk (a common sight on the Curonian Spit) and three-masted sailing vessel can clearly be identified. It is not known how many other boats displayed similar pennants; however it is known that at least one other U-boat, U-663, displayed a similar Pillkoppen pennant from its flagstaff. The tradition of displaying these decorative pennants did not die completely with the collapse of Germany and the absorption of this region of East Prussia into the Russian and Lithuanian SSR - they can still be found in many of the now renamed fishing villages in what is modern-day Lithuania, where they are promoted as something of a historical tourist attraction.